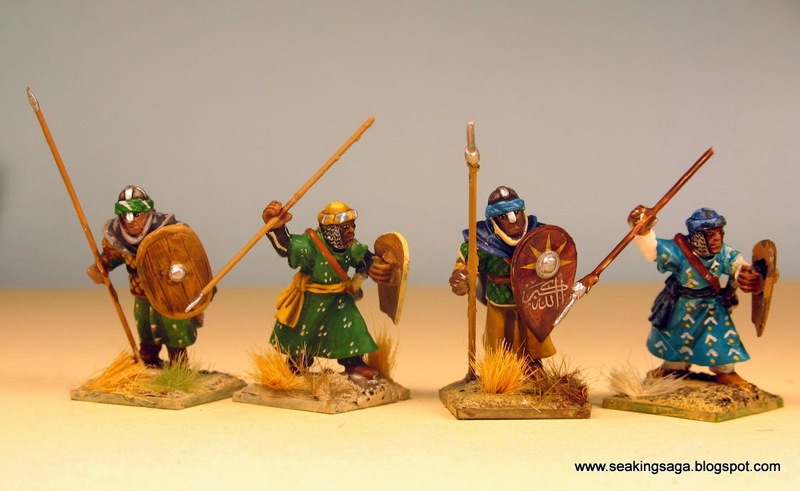 Gripping Beast's Plastic Arabs are good for the bulk of your force, whether you are skirmishing or doing mass combat, but you are going to need to supplement them with some heavy infantry. And for that, metal figures are currently the only option. 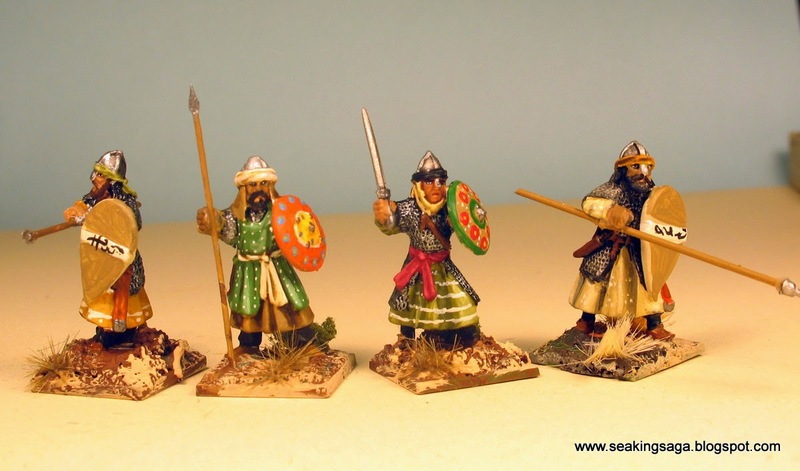 My first era of interest in wargaming was El Cid Spain and over the years I have picked up a decent variety of ranges from a few companies. 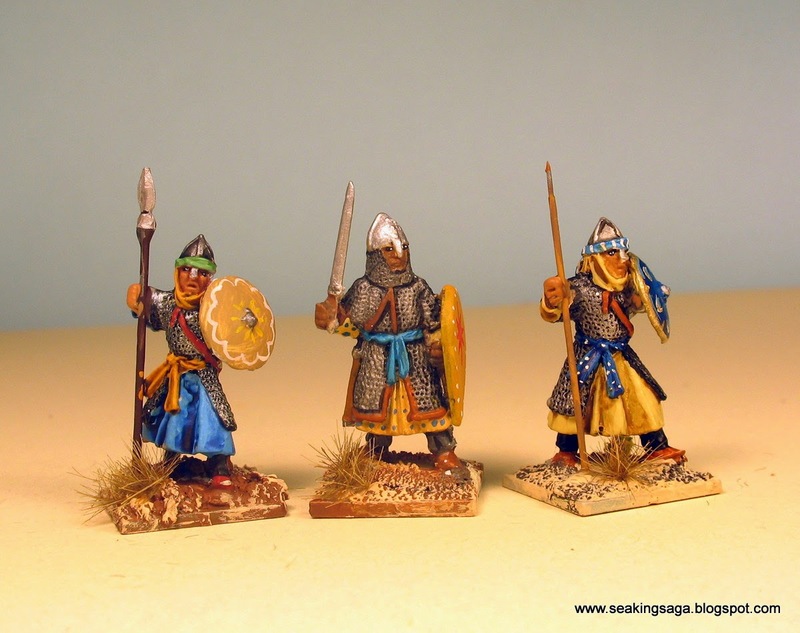 Gripping Beast produces several lines of Arabic or Islamic themed miniatures. 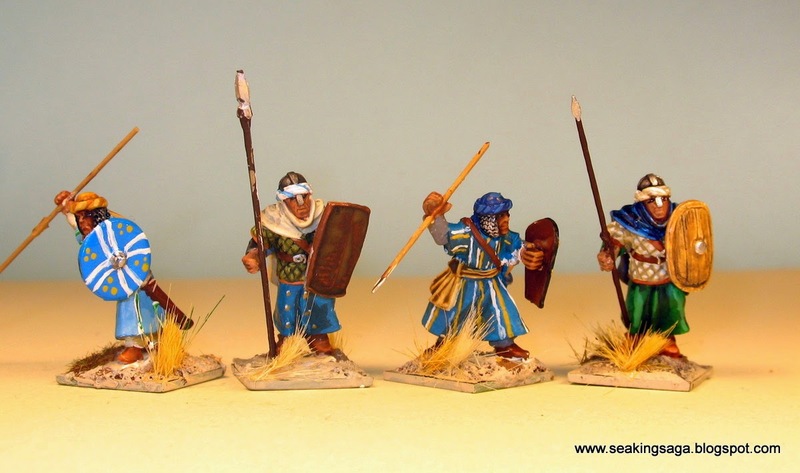 Below are some Andalusian infantry, the Arab or Arab-Spanish warriors of early Medieval Spain, which I painted recently. The knights of Cordovan Spain were poets as well as warriors. Christian warriors from Europe including the mighty El Cid often took up service among the rival emirates in southern Spain. There, the Christians were exposed to ballads, poems and refined court manners. After returning to their own lands, the influence of Muslim Spain can be seen in the culture of troubadour songs, chivalry, and courtly love that developed in feudal Europe during the high Middle Ages. Passed Tarfe and Belchite's King. The King is Dorelice's slave. And verdant are the vests they wear. The lights of many a costly gem. Artizan Designs also produces a line listed as "Moors," an overly general term, for their offerings include Andalusians, Berbers and Sudanese Africans. This pack of eight included two poses, one of whom wears chainmail under his robes and the other quilted armor. I painted these a couple of years ago (or more) but did some retouching, especially on the shields. Overall, I think the Artizan wins the shoot-out. The Gripping Beast figures have less distinct facial features and some of the chain mail detailing is a little muddy. And while the splayed arm pose on the Artizan figure is awkward, it is dynamic on the game table. Well done. Those look fantastic. Great painting and basing work! Dang... them are pretty!! Well done. Fantastic figures! Colors and robe details are eye-catching.